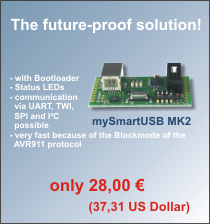 mySmartUSB MK3 is a compact high-speed USB programmer, designed in SMD construction and as a daugther board. So it is possible to programm a large number of AVR systems via the USB interface with this board. 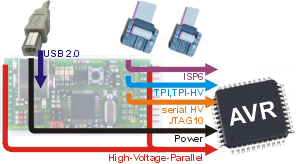 JTAG interface and ISP interface expand the application possibilities. 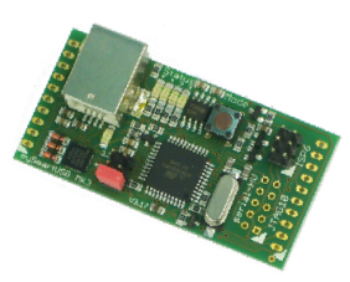 The communication interface can be used as UART, TWI/I²C or SPI-Bridge. The communication with a PC works completly transparent via a virtual COM port. 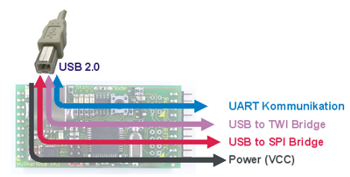 The board will be connected via USB interface with the PC and supplied with power. 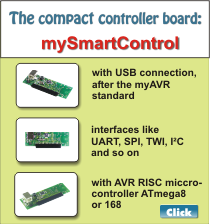 A large number of AVR systems can be programmed with this board via the USB interface and communicate with a system via an UART-USB bridge. With the preinstalled bootloader it is possible to update the firmware for new types of controller and protocols. 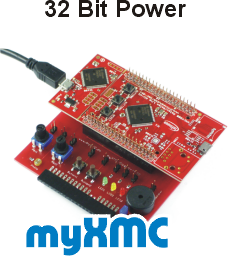 In addition, mySmartUSB MK3 can be used as a basis for further applications, for example for a UART-USB, SPI-USB, TWI-USB converter. For a bigger sight click on the picture!